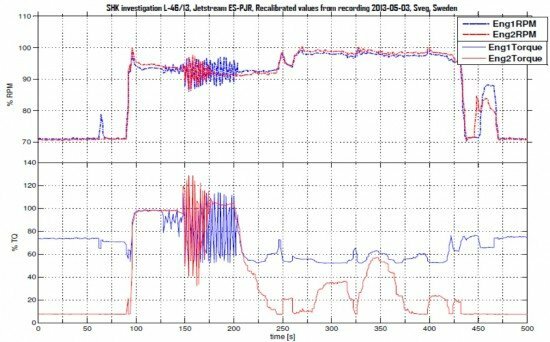 An investigation by the Swedish Accident Investigation Authority revealed that a serious incident with control problems on a Jetstream 31 airplane in 2013 was caused by a too low RPM setting on takeoff. airport and perform a normal landing. The airplane manufacturer revealed that it was a known problem that a start with a too low RPM in some cases could cause engine problems. There had been a serious accident in which a too low RPM setting was found to be the root cause. The operational documentation of the operator did not contain a requisite level of information on potential risks when starting with too low RPM. The aircraft type has no warning system to identify a faulty engine configuration and the checklist does not contain a “memory item” procedure for immediate action by the crew. At the examination carried out in connection with the incident, technical deficiencies were also found. Corrosion damage and temporary repairs in some of the aircraft systems were noted at the technical investigation. Furthermore, it was found that there where technical remarks that had not been entered in the aircraft logbook. The incident was likely caused by a too low RPM during take-off. A contributing factor was that the aircraft type has no warning system for take-off with an incorrect engine configuration. Investigate the conditions for installation of a warning system on the aircraft type in question which notifies the pilots of an incorrect engine configuration in connection with take-off. Endeavour to revise the emergency checklist for this aircraft type so that measures in the event of engine oscillations in connection with take-off are changed so as to be included as “memory items”. Take measures to ensure that initial and recurrent training on this aircraft type are supplemented with information and training regarding the risks of incorrect engine configurations during take-off.